The aromatic root of the turmeric plant has been used for centuries as a treatment for digestive disorders, inflammation, arthritis and infection. Many of turmeric's historic uses are not necessarily supported by scientific evidence. Nevertheless, turmeric supplements are commonly prescribed as a component of modern integrative medicine. According to the University of Maryland Medical Center, early studies suggest that turmeric can promote the health of your joints, blood vessels and digestive tract. Compounds in turmeric capsules may also offer hope as a complementary cancer treatment. Turmeric can reduce symptoms of indigestion and dyspepsia by promoting the production of bile. The University of Maryland Medical Center notes that turmeric can also relieve gas and bloating. Curcumin, an extract of turmeric, is commonly used in over-the-counter herbal supplements for digestive health. Some naturopathic practitioners recommend turmeric as a complementary treatment for Crohn's disease and ulcerative colitis. However, the University of Maryland Medical Center warns that turmeric can make stomach ulcers worse. Both in-vitro tests and clinical trials have demonstrated that turmeric effectively reduces inflammation. Because of this, practitioners commonly recommend turmeric capsules to people suffering from chronic inflammatory diseases, such as arthritis. Turmeric capsules can promote heart health in several vital ways. Compounds in turmeric help to lower low-density lipoprotein, or "bad," cholesterol levels and prevent cholesterol from building plaque on blood vessel walls. Turmeric can also prevent platelets from clumping together, which may reduce the risk of blood clots. According to the University of Maryland Medical Center, turmeric may help to prevent or treat some forms of cancer. 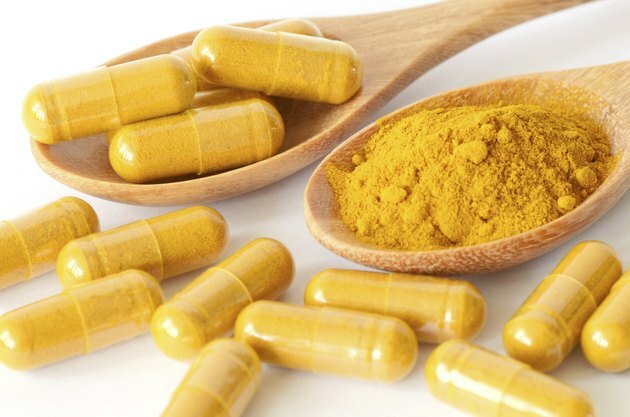 Curcumin, a compound in turmeric capsules, is a powerful antioxidant. As a result, turmeric may protect cells from oxidative damage, which is a risk factor for cancer. Additionally, early animal tests have demonstrated that intravenous curcumin can kill prostate, breast, skin and colon cancers in animals. However, as these studies are inconclusive, you should not use turmeric to replace proven cancer treatment methods.